At Sundance Dental & Orthodontics, our passion is helping Farmington patients achieve and maintain a healthy and beautiful smile. Dentist Michael Tornow’s considerable experience, advanced skills, and exacting standards ensure the ultimate in patient satisfaction. Because each Farmington man, woman, and child has unique dental needs, we develop a personalized treatment plan that addresses each patient’s challenges and goals. Some Farmington dentistry patients come in twice-yearly for an examination, cleaning, oral cancer screening, and fluoride treatment. We work with them to maintain their oral health and prevent common dental problems such as cavities and gum disease. Many Farmington smile makeover patients take advantage of modern cosmetic dental procedures to achieve the smile they deserve. If you are unhappy with your smile, contact us today at 505-985-5626. We offer a broad range of cosmetic dental procedures including dental bonding, porcelain veneers, dental crowns, teeth whitening and tooth-colored filling replacement. 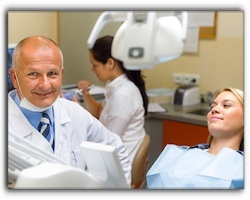 We also offer sedation dentistry options for Farmington folks who become anxious during dental treatment. You can take comfort in the fact that we are dedicated to the highest standard of safety and sterility at our practice. If you are looking for a family dentist or cosmetic dental specialist in the Farmington area, call Sundance Dental & Orthodontics at 505-985-5626. We invite you to visit our comfortable Farmington dental office and friendly staff. Sundance Dental & Orthodontics is New Mexico's leader in hi-tech dentistry. With offices in Farmington, Bloomfield, Rio Rancho, Grants, Gallup, Kirtland, and now Cortez, CO, the amazing doctors and their teams are giving New Mexico patients something to smile about. They offer exceptional cosmetic dentistry, dental implants, orthodontics, family dentistry, and so much more. They even offer sedation dentistry to those who have dental anxiety. Call today and experience for yourself the difference Sundance Dental & Orthodontics can make in your life.